Harmony Hustle is a party game in Mario Sports Mix where the sport of this game is volleyball. This game can be played with up to four players, in three different courts: Peach's Castle, DK Dock, and Bowser Jr. Blvd. The objective of the game is to score as many points as possible. 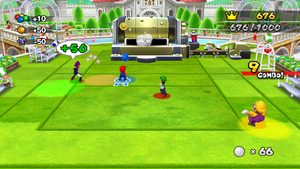 Players can score points by hitting balls of their respective color. A colored circle will show where the ball will land; the player of that specific color must hit that ball. Player 1 gets the blue balls; player 2 gets the red balls; player 3 gets the green balls; player 4 gets the yellow balls. Players earn 10 points by hitting a ball. Collecting coins gives players an additional 10 points for each coin collected. Spiked balls make players lose 50 points, and will end their combo. Hitting a multi-colored ball gives the player 50 points. Any player can hit the multi-colored balls for points, though mechanically they are aimed towards a particular player, and so may result in a player being unable to get to one of their own balls afterwards. It is possible to hit other players' balls to preserve the current combo, but this temporarily distorts the music and does not award points; in addition, characters prefer to dive for their own balls nearby than to hit another player's ball directly overhead. CPU players do not contribute points when they hit their own-colored balls, and they do not cause the loss of points or combo if they hit a spiked ball, but they must still hit their balls to continue the combo. CPU players do contribute points from multi-colored balls and coins. Other obstacles can pop up as well, such as Banana Peels and Mini Mushrooms. Hitting these can hinder players, which can cause combos to end. If players manage not to miss any balls, they earn bonus points for every ten combos (50 for ten, 100 for twenty, and so on). The game has a sense of rhythm to it, as depicted by the music that is played during the stage, which differs, depending on the court being played on. Just like in a volleyball game, there is no time limit, but the game will end when the music ends. The harder levels can be unlocked by clearing the songs in Party Mode, or by clearing certain alternate paths. Along with those songs are the Mix Medley songs, which combine the three basic songs into one. To unlock the Mix Medleys, players have to clear all the normal songs in tournament mode. The tournament cup that's being played will determine the Mix Medley that'll be unlocked; for example, clearing all the normal songs at the Mushroom Cup will unlock the Mushroom Mix Medley. The medley songs are often harder than the normal songs, since many kinds of obstacles can pop up to mess up the players. Harmony Hustle at Bowser Jr. Blvd. The "Chocobo" songs are remixes of Chocobo's Theme, a famous and recurring music track in the Final Fantasy series. This page was last edited on March 28, 2018, at 18:05.